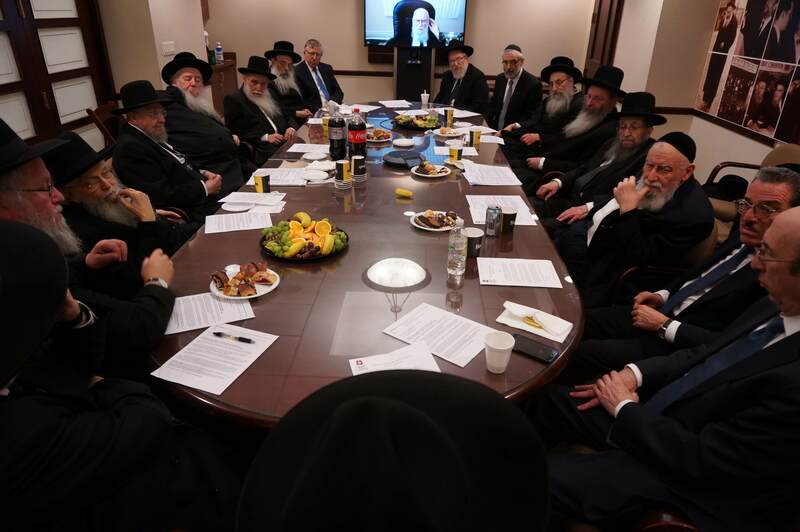 The Moetzes Gedolei HaTorah and select others met yesterday at Agudath Israel Headquarters. 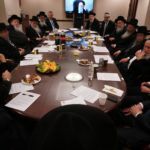 Among the subjects discussed were the threat to the Jewish nature of the state of Israel posed by a very aggressive reform movement, protecting our children, and helping insure that every Jewish boy and girl find their zivug. L to R: Rabbi Elya Brudny, Rosh Yeshiva, Mirrer Yeshiva; Rabbi Dovid Feinstein, Rosh HaYeshiva, Mesivta Tiferes Yerushalayim; Rabbi Aharon Schechter, Rosh HaYeshiva, Yeshiva Rabbeinu Chaim Berlin, ; Rabbi Yaakov Perlow, Novominsker Rebbe and Rosh Agudas Yisroel; Rabbi Ahron Feldman, Rosh HaYeshiva, Yeshivas Ner Yisroel; Rabbi Yosef Frankel, Vyelipoler Rebbe; Rabbi Yosef Chaim Golding, Chief Operating Officer, Agudath Israel of America; Rabbi Avrohom Chaim Levin, Rosh Hayeshiva Telshe Chicago (by tele-conference); Rabbi Labish Becker, Executive Director, Agudath Israel; Rabbi Chaim Dovid Zwiebel, Executive Vice President, Agudath Israel; Rabbi Yaakov Horowitz, Rosh HaYeshiva, Yeshiva Beis Meir; Rabbi Aryeh Malkiel Kotler, Rosh HaYeshiva, Beth Medrash Govoha; Rabbi Shmuel Kamenetsky, Rosh HaYeshiva, Yeshiva Gedolah of Philadelphia; Rabbi Yosef Harari-Raful, Rosh HaYeshiva, Yeshivat Ateret Torah; Shlomo Werdiger, Chairman of the Board of Trustees, Agudath Israel of America; Rabbi Shlomo Gertzulin, Executive Vice President for Finance and Administration, Agudath Israel of America; Rabbi Simcha Bunim Ehrenfeld, Mattesdorfer Rav (via tele-conference).